A Guide to Wedding Veils | Your Top 20 veil questions - answered! 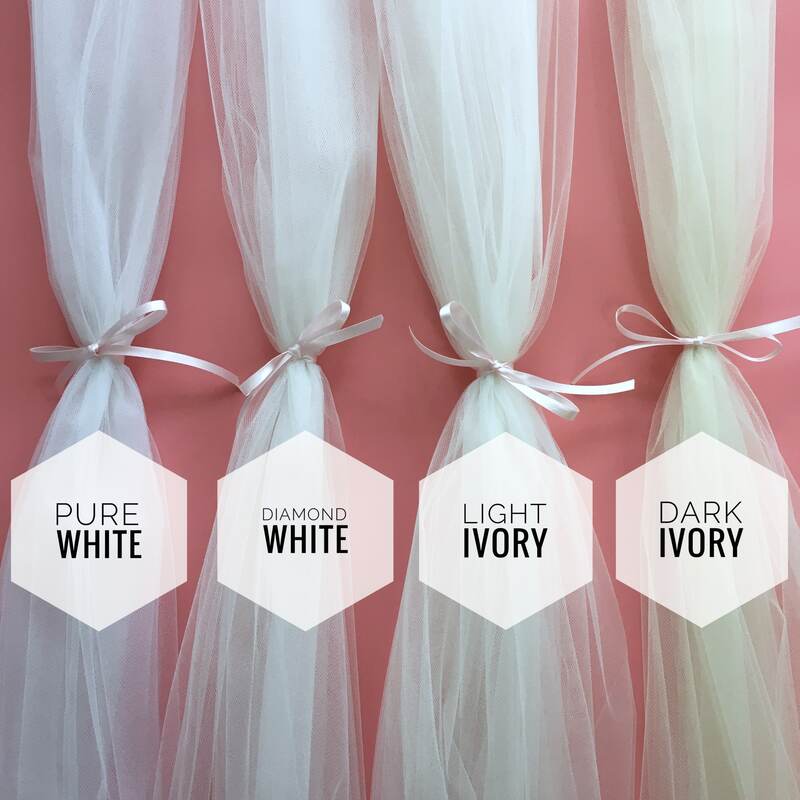 Your Top 20 wedding veil questions – answered! 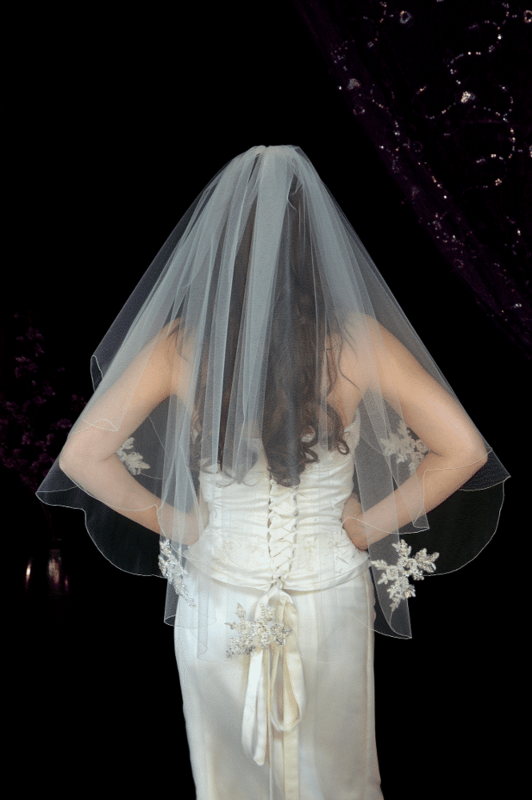 Most of the questions we receive have to do with wedding veils. It’s the topic that seems to baffle our brides the most. Just when you’ve got a handle on the difference between a fishtail and a ballgown dress, you’re being asked whether you’d like your veil fully gathered or centre gathered and what does that even mean anyway!? 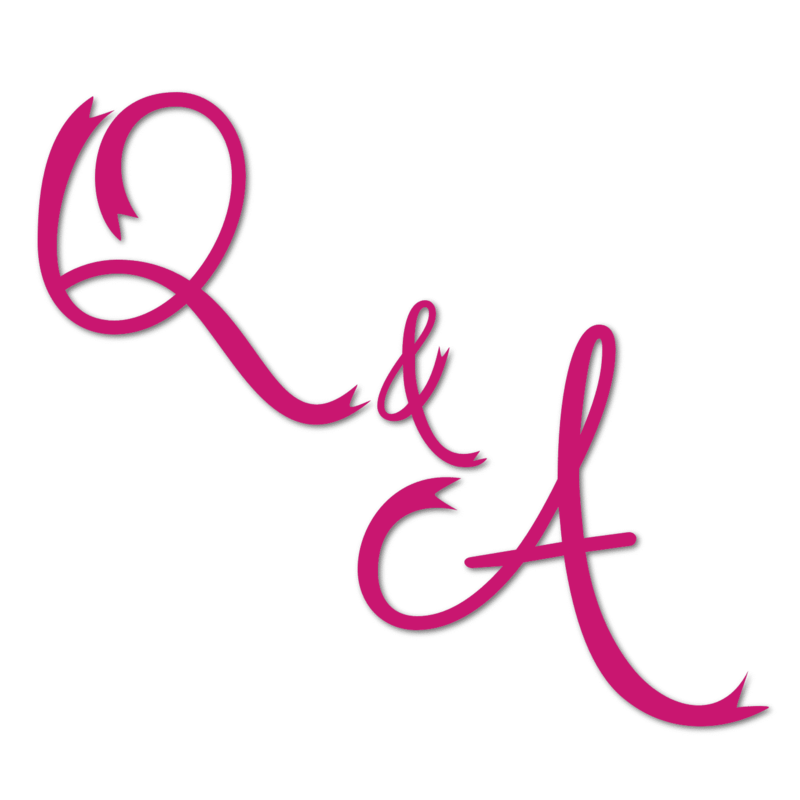 So, here we have your Top 20 veil related questions, answered by the people who make them! 1. What lengths do veils come in? Two layer chapel length with a total combined length of 126"
It differs from place to place, but consistently there are about 4-6 common lengths. The most popular of those being waist length (sometimes called a 54 inch), fingertip length (72 inch), chapel length (126 inch), and finally cathedral length (144 inch). These figures are the total combined length of the longer bottom layer and the shorter top layer that goes over the bride’s face. For ourselves, our veils come in 8 different lengths. We’ve sneaked in a couple of in-between lengths such as hip length (goes between waist length and fingertip length) to give brides of all heights more options. You can view them all on our Length Guide page. All our measurements listed are from comb to end and are not rounded up to include the blusher (the bit that goes over the face) measurement as in the examples above. We make a lot of single layer veils that don’t have a blusher, so we prefer to list all lengths individually. That way if you get your tape measure out at home, they’ll measure exactly what was stated with no surprises. 2. My dress looks white. Should I get a white veil? Oh my. Even just reading this question makes us hyperventilate. This is something that comes up a lot! 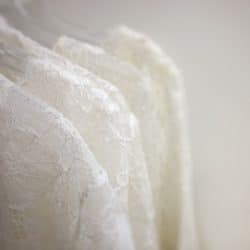 So much so, that even without seeing your dress we’d feel confident enough to say that your dress is very likely to be at least an off white, if not a pale ivory, as most sample dresses in bridal boutiques are some form of ivory. 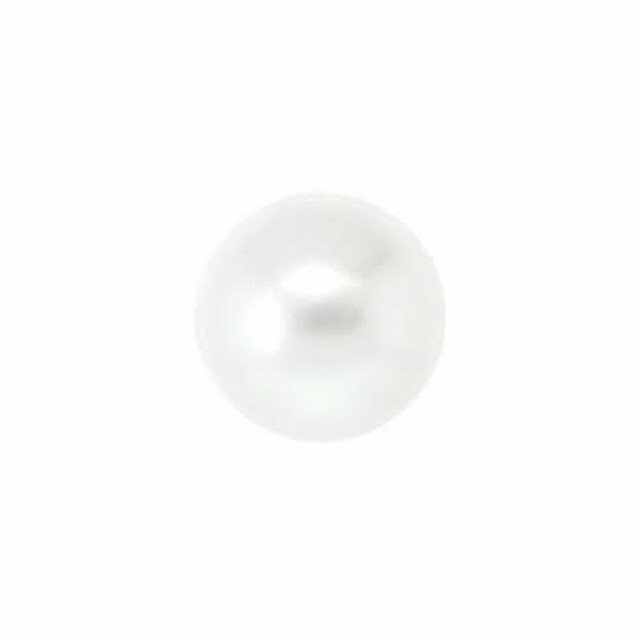 It’s just more flattering against the skin than pure, arctic white. So even if your dress looks really pale and you’re sure it must be white, 9 times out of 10, in our experience, it isn’t. The best thing to do to reassure yourself would be to call your dress shop and ask them to confirm the colour they’ve ordered your dress in from the supplier/designer. Don’t forget to check out our Colour Guide for more on this. 3. 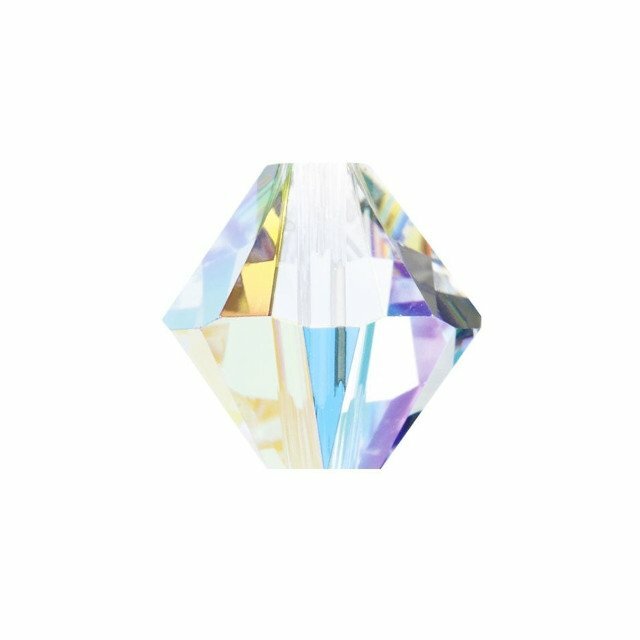 When is the best time to order my veil and other accessories? Well, hang on a minute. Let me just dig out our handy-dandy little infographic! 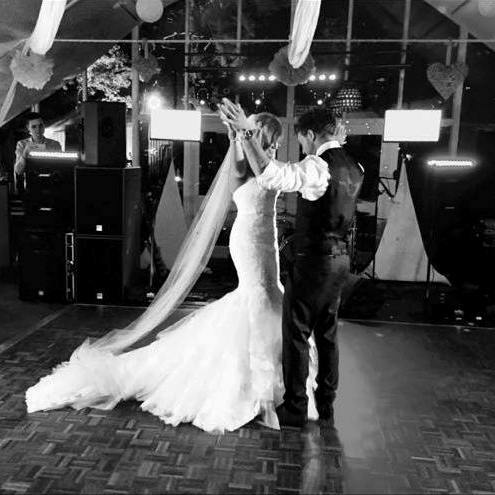 We believe the best time to order your veil and accessories is around 4-6 months before the Big Day. Obviously, it depends where you’re getting them from (ahem…) — overseas orders, for example, can take a lot longer. 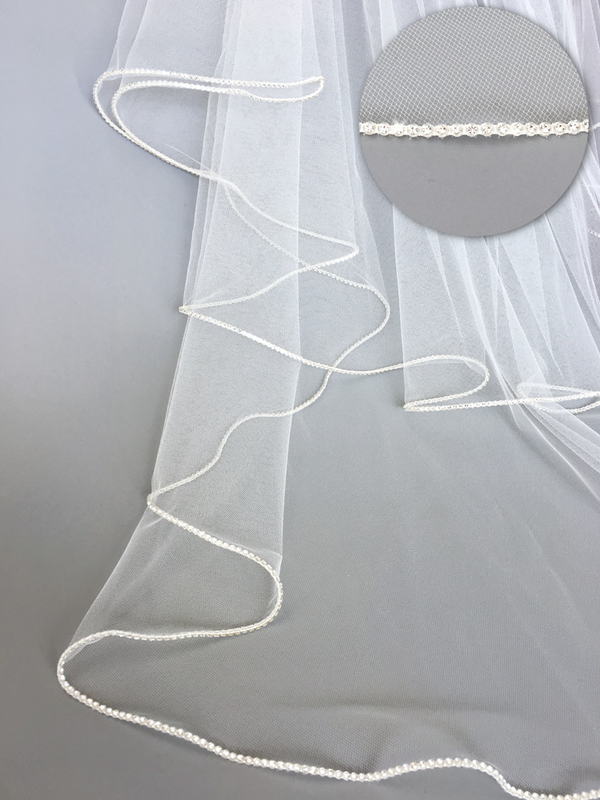 Speaking only for ourselves for a moment, our typical lead time for veils is 3 weeks as they’re made to order, but we also accommodate more urgent orders on request. You just need to add on our Rush Service when you order online. 4. My dress has lace, should I get a matching lace veil? When it comes to matching up to a lace dress, we find brides tend to be in one of two camps. They either decide that the dress is detailed enough and any more lace would be overkill, or they fall in love with lace so much that there’s no such thing as too much anymore! The good thing is, the lace on your veil doesn’t have to be an exact match to your dress. However, if you speak to someone who’s familiar working with laces such as ourselves, they’ll be able to at least help you match the “type” of lace. For example, is it Corded, French, Guipure, etc? 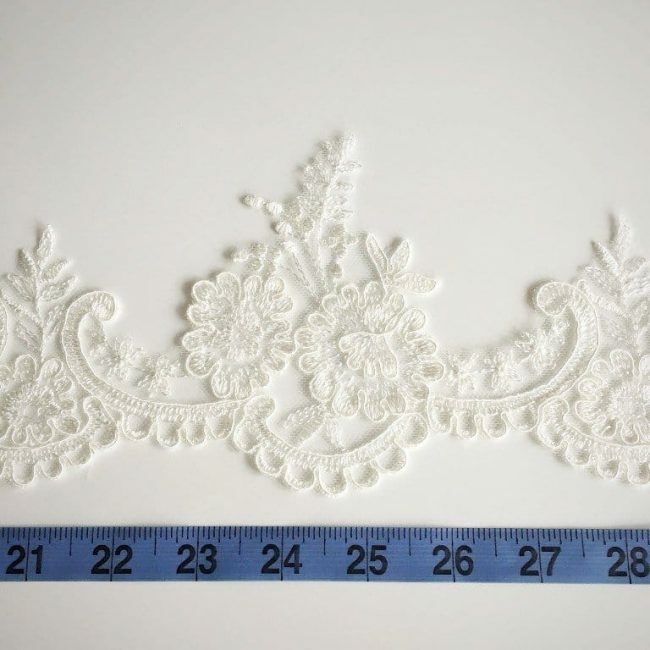 We work with a wonderful lace supplier who has more than 500 lace trims and appliqués to choose from so there’s sure to be one that will complement your dress in there somewhere. And you don’t have to have lace all over the veil, either. 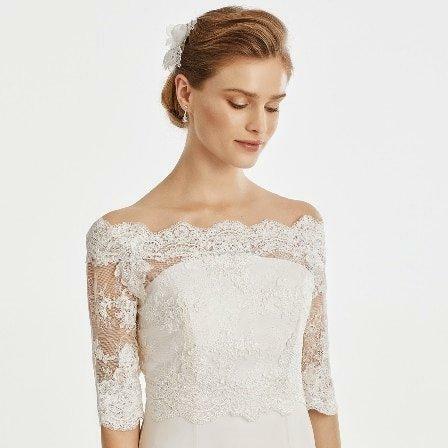 If you love lace but are worried about it all being a bit too much, you could always go for a long veil and have lace just around the base curve so that it extends past your train and doesn’t actually cover the dress at all. 5. What are the different gathering options for veils? There are three main gathering styles for veils – ungathered, centre gathered and fully gathered. The ungathered style is the easiest to explain; it has no gathering at all and is often described as a drop veil due to the way it sits quite flat to the head and hangs in a drop (think Kate Middleton). A Mantilla is also completely ungathered. See question 12 — What are the different types of veils? Moving on to centre gathered and fully gathered — these two options are much more commonly seen, with the centre gathered style being the more popular of the two. The main difference between the two styles is the shape at the sides; the centre gathered style has a pretty cascade effect at the sides and has sections that can be brought around the arms and shoulders if desired, whereas the fully gathered style is much more narrow but also a lot fuller at the comb as it has twice the amount of fabric gathered there compared to the centre gathered option. Check out our video explaining this further! 6. Why do you wear a wedding veil? The tradition of the bridal veil dates back centuries. One of the original reasons for veiling the bride was to hide her face from the groom prior to the wedding because it was, and still is for most people, thought to be bad luck for the groom to see the bride before the ceremony. These days, the tradition has loosened somewhat as they often do. And although it’s still common for the bride and groom to spend the night before the wedding apart, it is now also perfectly common to see an unveiled bride walking down the aisle. We often ask our brides if they plan to wear the blusher over the face as it helps us figure out if a one or two tier veil is required. About 50% of our brides answer yes. Gotta keep Grandma happy, am I right? For a more detailed history of the veil and the traditions surrounding it, visit its Wikipedia’s page. 7. 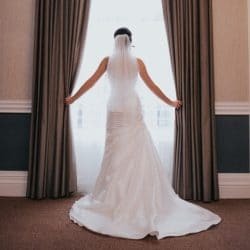 How long should my wedding veil be? 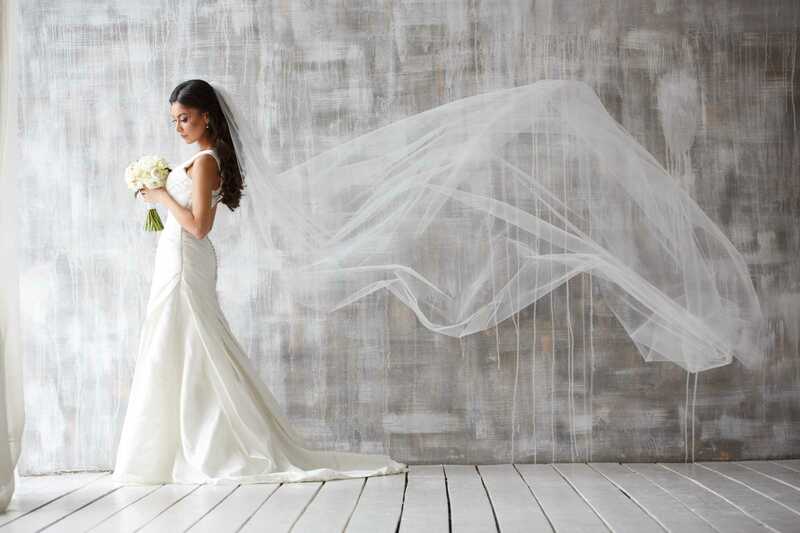 We usually get this question from brides looking for long, full-length veils. What they’re trying to figure out, essentially, is the length of the train they have on their dress so they can buy the appropriate length veil to match with it. There are three standard full-length veils — floor length, chapel length, and cathedral length. 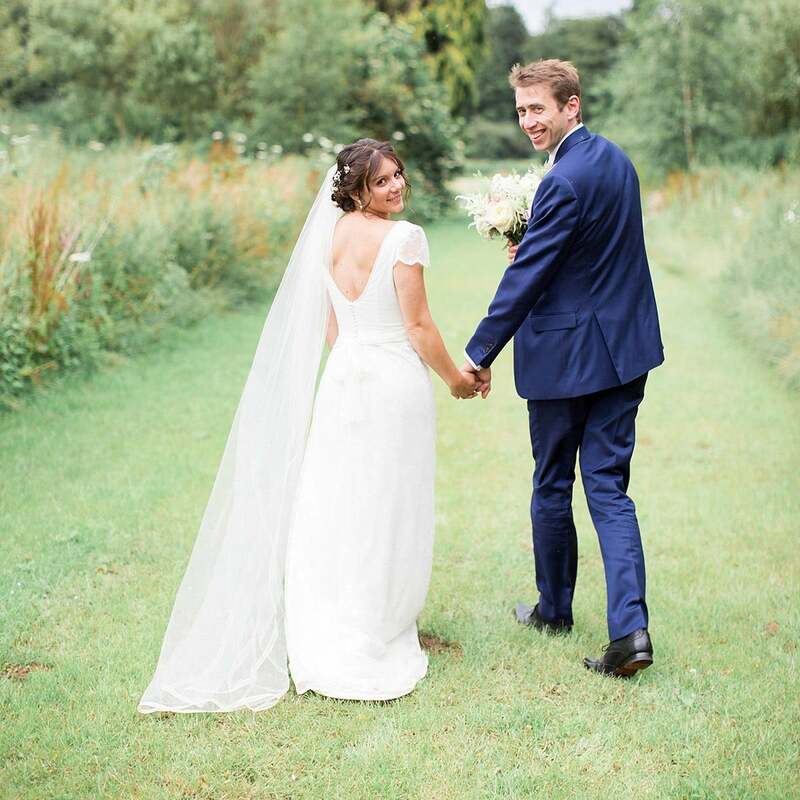 We’ve dug through our real bride archives to find some examples of each train length paired with its perfect matching veil so you can hopefully get a sense of where on this scale your own dress fits. For brides looking for something a little shorter, a great way to decide on a length is to look at your dress’ overall shape and try to find a spot that makes sense to you visually. For example, fingertip length looks great paired with mermaid/fishtail gowns that kick out from the same area on the body. Whereas a gown with a natural waistline looks great with waist length (or possibly elbow length if you’re petite). You’ve already got a horizontal line there from the waistline detail — be it a seam, a belt or other embellishment — so your veil may as well finish there too. There’s no sense in creating extra, unnecessary horizontal lines, am I right ladies? Don’t forget to check out our full Length Guide for more ideas. 8. How do you store a wedding veil? 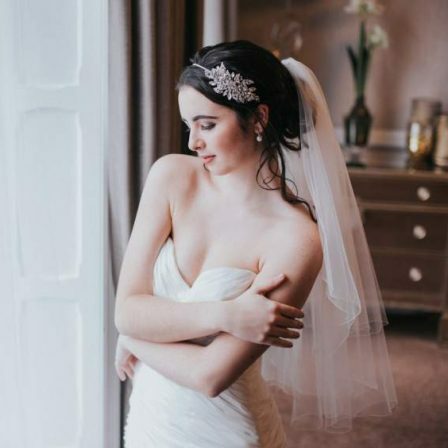 Caring for your bridal veil at home, especially if it’s a very long one, can take some careful planning. The absolute ideal situation would be if someone has a spare bedroom where it can be left to hang, undisturbed and safe from any pets (and future husbands! ), right up until the wedding. Obviously, this won’t be possible for everyone. You may have no option but to leave it in its box until nearer the date. At that time, it would naturally have acquired some wrinkles. 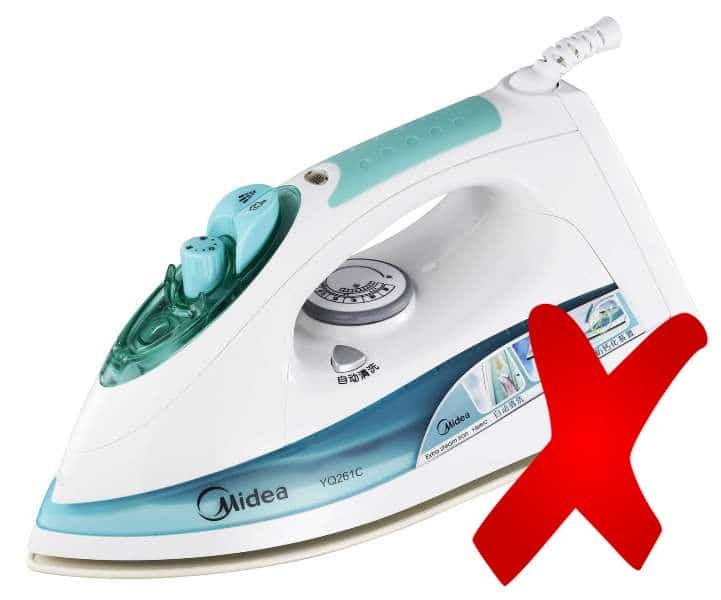 To help smooth them out, you can steam it at home using a hand-held steamer or a steam shot iron, so long as you don’t let the hot plate of the iron actually touch the tulle. (See question 11 — Can you iron a wedding veil?) Or you can take it to a local dry cleaner and have them steam it for you. 9. Who lifts the veil at a wedding? 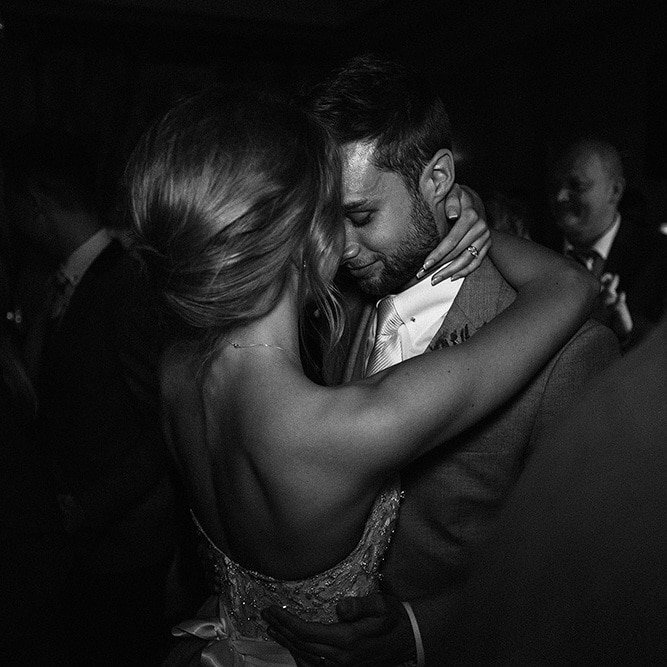 There are a couple of options for this, and ultimately it’s up to each bride and groom how they want their ceremony to go. Option one would be to have the Father of the Bride lift the veil once the bride reaches the top of the aisle as a way of presenting her to her soon-to-be husband. This can be quite a sweet moment and it takes care of it early so you don’t have to think about it again. You could even have a little practice before you make your entrance. 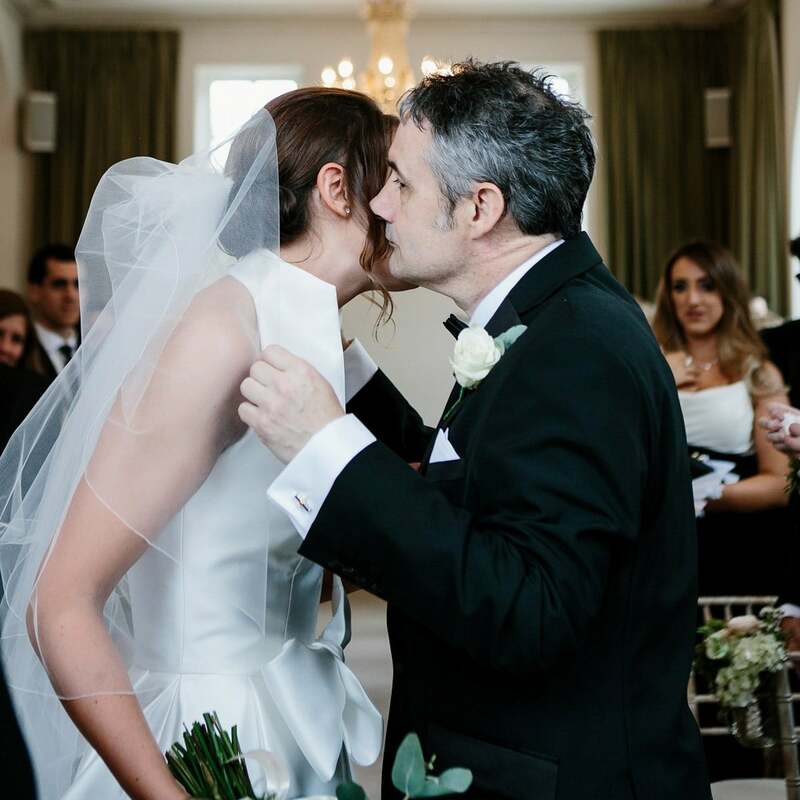 With option two, the bride keeps the blusher over her face for the entire ceremony and waits for that movie-worthy “you may now kiss the bride” moment. This time it would be her new husband that lifts the veil, to raucous applause, I’m sure. 10. Can I wear a veil with my hair down? You can wear a veil with your hair down, although I won’t lie to you, it is the hardest way to secure it as there’s not really anything there for the comb to grab on to. Having your hair half-up-half-down would be slightly easier, but either way, you’d need to secure the comb into the hair with Kirby grips. For this to work, you need to make sure the veil you purchase has a metal comb. A comb with plastic teeth would snap when you attempt to grip it in. All our veils come on 7.5cm wide metal combs as shown below. 11. 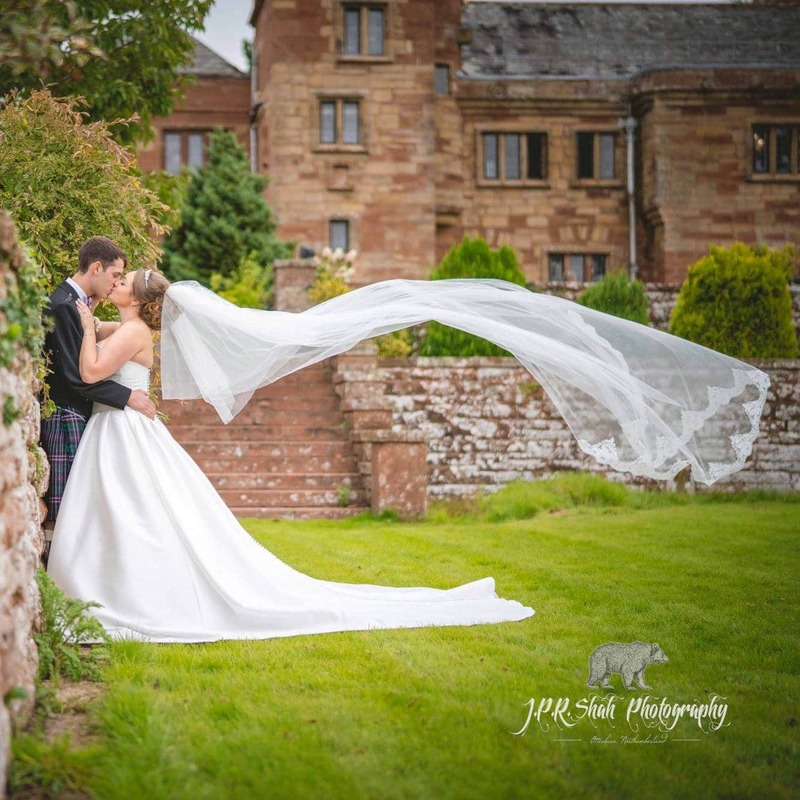 Can you iron a wedding veil? In a word: No! Most definitely not. We don’t ever want a repeat of the phone call we got from a devastated bride who had done just that and burned a lovely triangular hole into her precious veil! Nylon tulle melts instantly above a certain temperature. And since you’ve no way of testing for that temperature on your one and only veil, you just can’t risk it. 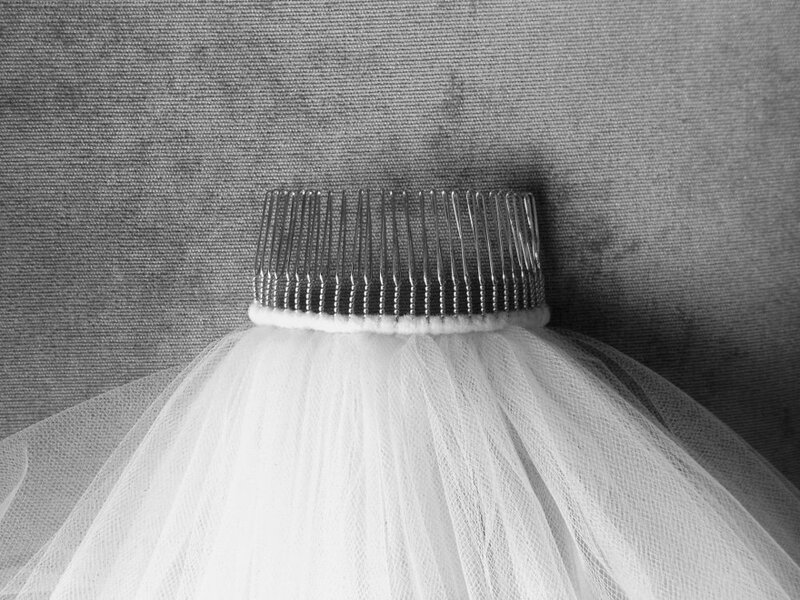 As veil makers, we do use an iron here at the studio, but we have rigorously tested for the maximum temperature our tulle can stand. 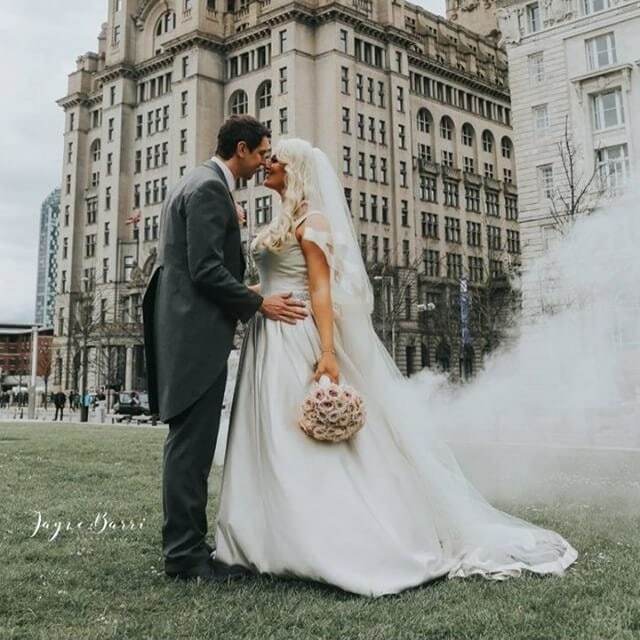 And as your veil is steamed and crease-free directly before it goes in its box, a simple steam should be all you need anyway. 12. What are the different types of veils? There are a few different types of wedding veils. Some examples of these are shown below. 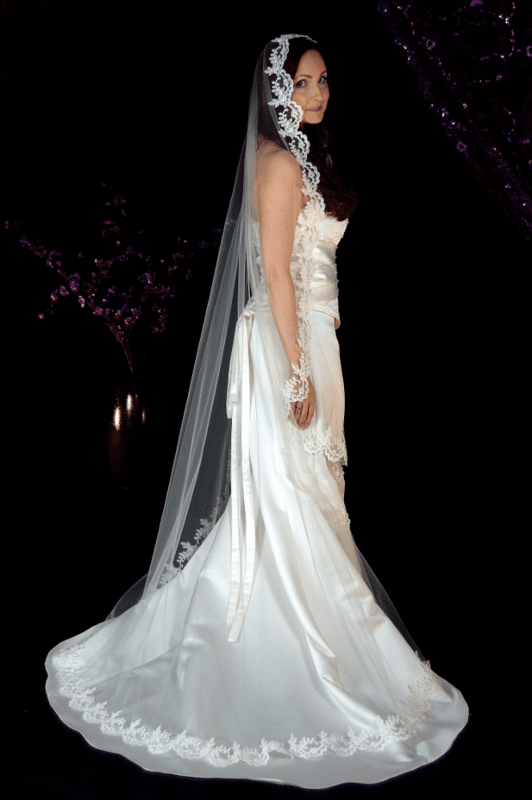 The most popular styles by far would be the simple one or two layer veils. This is your classic, traditional veil. All of the other options are designed to create slightly different shapes and looks and are a more alternative option. 13. 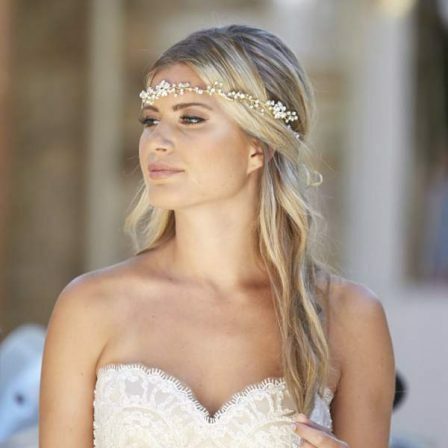 Should your headpiece be attached to your veil? These days it’s much more common for them to be separate pieces. That way, if you want to remove your veil later on for the reception so you can boogie on down, you still have a pretty hair accessory in place. 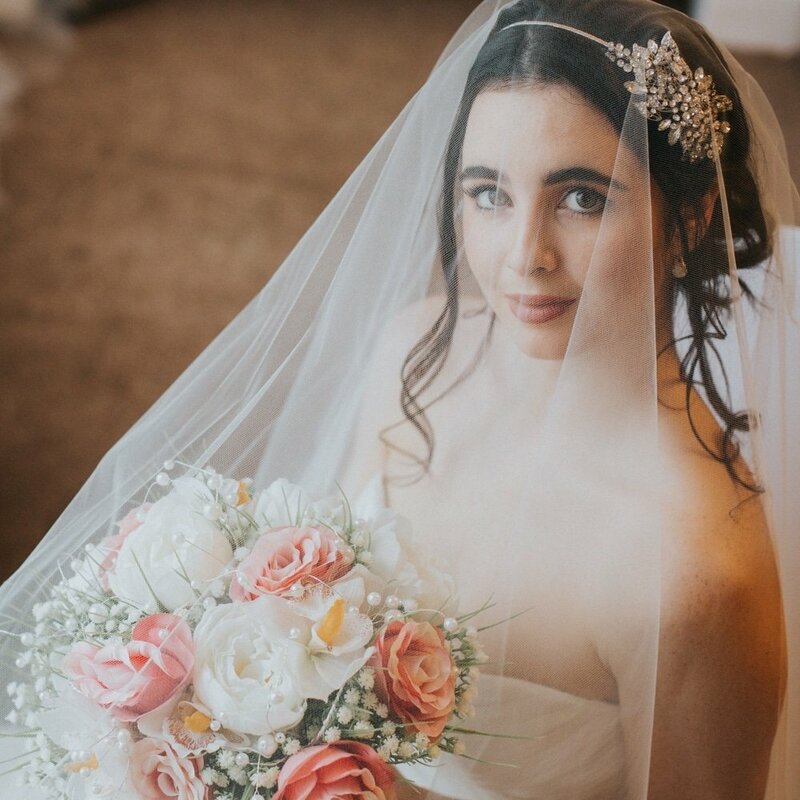 On occasion, we have been asked to attach a veil straight onto a headpiece or onto a plain headband for brides who wear wigs or have ultra-fine hair, etc. We’re more than happy to do this or any other kind of attachments as necessary. Just ask! 14. Do veils come with a comb? They sure do! That’s the standard attachment for veils. 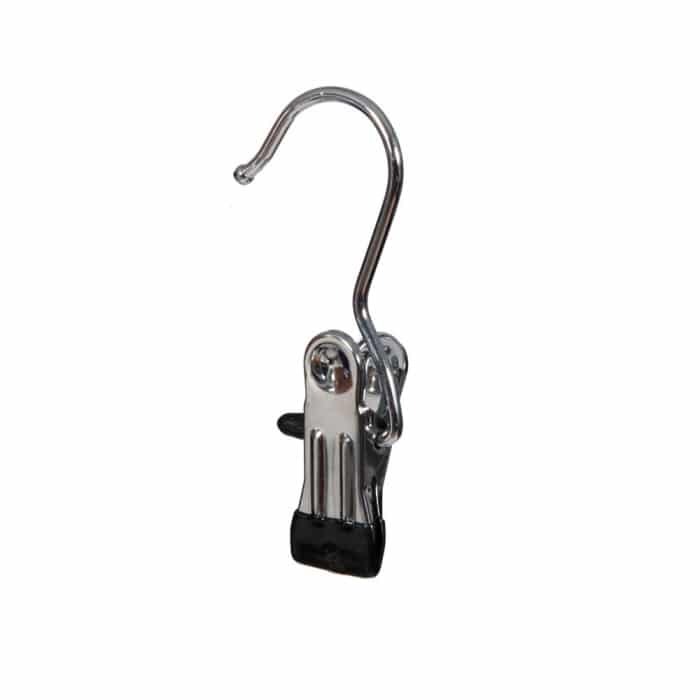 As we mentioned in an earlier question, we use high-quality metal combs that can be gripped into place so they are secure even if your hair is worn loose. The only exceptions to this could be un-gathered drop or mantilla styles. We actually do still add a comb to ours if it’s possible to do so and still look okay. We can hide one under the lace on a mantilla, for example. But sometimes they do come without anything on at all and you’d be expected to secure it some other way such as with hat pins. I know most brides would find it easier to have a simple comb, so we use them unless we’re asked not to. 15. What are wedding veils made of? Veils are almost always made from bridal illusion tulle. 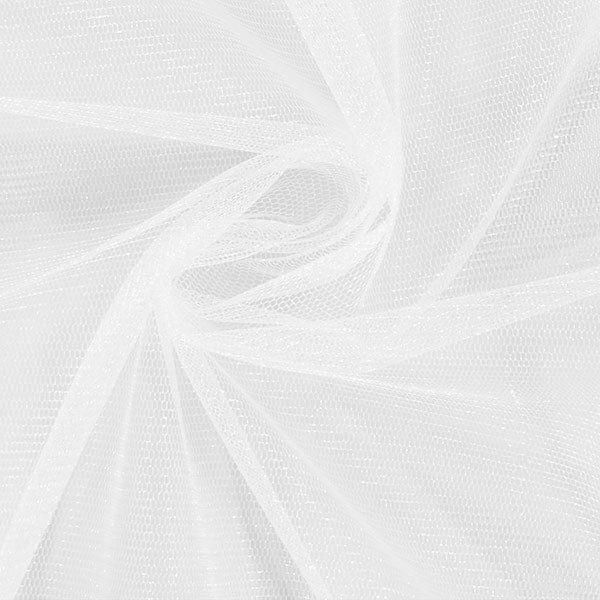 This is a soft and sheer type of nylon netting that’s made specifically for creating veils. Of course, there can be exceptions to this where they’re made from more non-traditional fabrics such as organza or chiffon. However, as these fabrics aren’t nearly as sheer, they’re not ideal. Especially if you want to wear the blusher over the face for the ceremony. Seeing where you are walking during the most important walk of your life is a must! 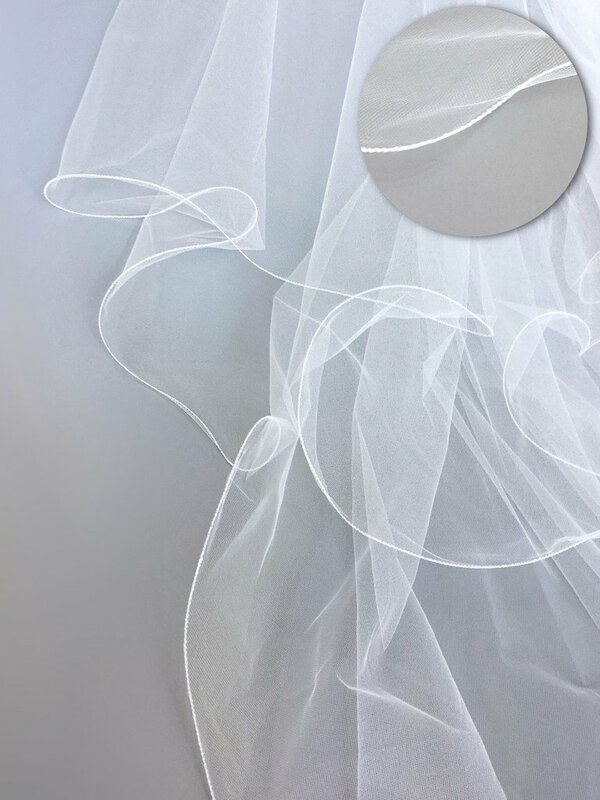 We have a couple of fabric additions to complement the traditional bridal illusion tulle. We recently we added a “silk effect” tulle, which is available on selected styles, and we also have a shimmer or “sparkle” tulle available in three colours and on selected styles. 16. What is a blusher veil? 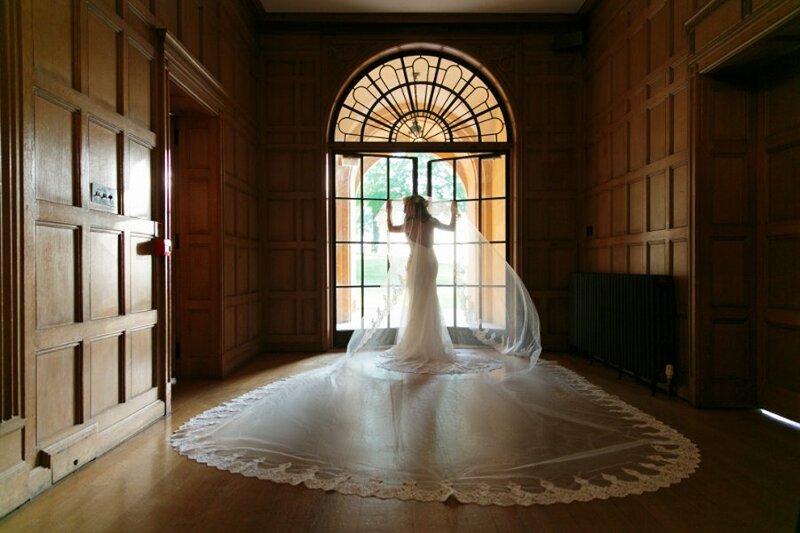 A blusher veil is the classic, traditional style with the layer that is worn over the face for the ceremony. Any veil with more than one layer can be worn as a blusher veil. There was a time when they all would’ve had two layers and every bride would wear it over the face without exception. But as we mentioned in an earlier question, these days only about half of brides choose to go this route. If you want your blusher to be extra sheer, choose a centre gathered or drop veil style. These will have less gather lines running vertically in front of your face. Blushers are typically around waist length (30 inches) unless, of course, the veil itself is shorter than that. You can check out all the individual layer lengths in our Length Guide. 17. Do you wear a veil during the reception? It’s really up to you. There are no hard and fast rules. But I think if you have opted for a long one you would probably want to remove it at some point during the evening. Even if it’s just to stop other guests standing on it! Also, a lot of dresses have the option to bustle them up — to shorten the train to floor length by means of a ribbon and loop inside the skirt. So if your dress has this option, it would be strange to then still have a super long veil trailing behind you, no? For shorter styles, fingertip length or above, you could easily wear it all day and all night and forget it’s even there! 18. Why do veils come in different widths? They come in different widths to match the large array of wedding dress shapes and to create different looks. 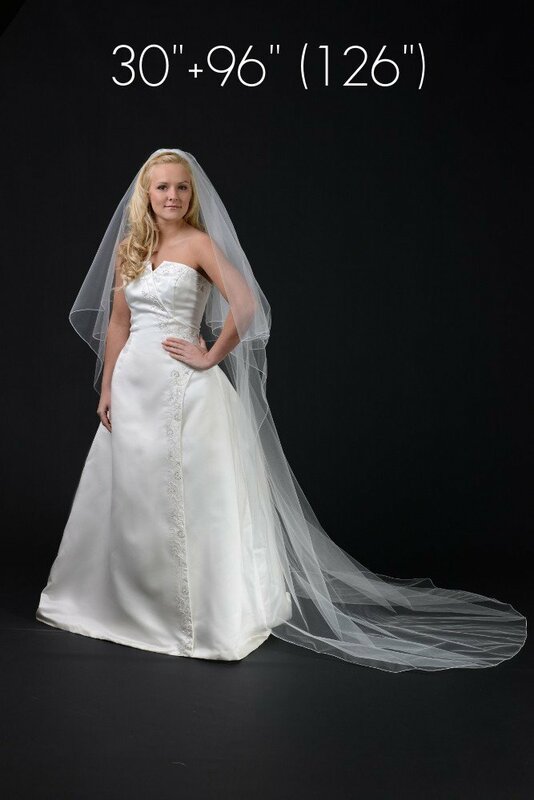 For example, a sheath or column dress looks great with a slim width veil. An A-line or mermaid gown looks great with a medium width style. And a ballgown looks fabulous with a really full veil. 19. 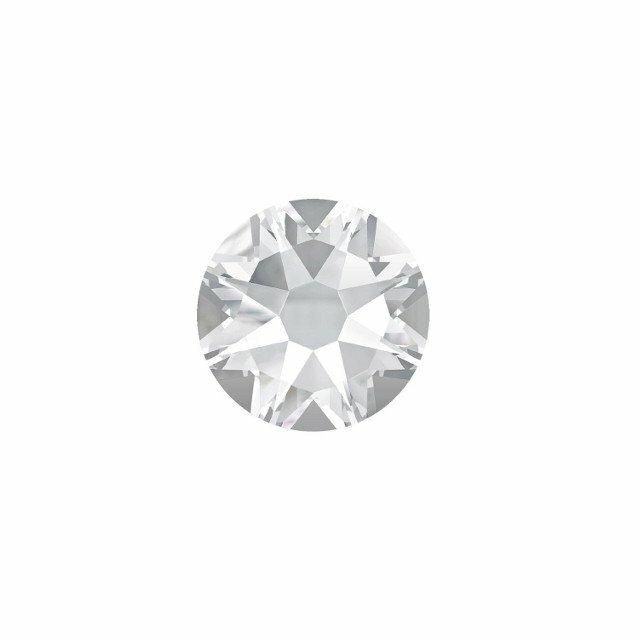 What are the different edge finishes for veils? 20. Which type of beading should I have on my veil? The type of beading you choose is going to depend on a few things. First, what’s on the dress? If the dress already has beading, you may as well tie it into the design. So try to notice if your dress has silvery diamantes, or pearls, or both! Second, what other accessories do you already have? If you’re wearing an heirloom headpiece, it might be nice to incorporate some similar beads into the veil to help it all work together a little more cohesively. And third, what do you like? Because if you want you can just throw point one and two out the window and go with that! We hope you found our Q&A style guide helpful. Did you have a question that wasn’t included here? Get in touch!